Buddhism began in India, nearly 2,600 years ago with the birth of Siddhartha Gautama. Through deep introspection, he came to realize a profound truth and to see the world around him beyond an ego-centered viewpoint. This insight allowed him to see the great Oneness of life, the interconnectedness of all beings, animate and inanimate. It was Great Wisdom and Compassion that were the contents of his enlightenment. After his enlightenment, the Buddha shared his insight and teachings with the people of India for the next 45 years. The teaching of the historical Shakyamuni Buddha spread throughout India, and then across the Asian continent over the course of these past 2,600 years. Buddhism flowed into China, Korea and Japan. It flowed into Sri Lanka, Thailand, Burma and Vietnam. Now, the flow of the Dharma is reaching and permeating the thought and lives of people in the West. Buddhism has been carried and transmitted over the many centuries because of its timeless and enduring message to the spiritual needs of human beings. The Buddha’s teaching seeks to help all beings find true peace, happiness and well-being. It does not require that we follow doctrines, beliefs or creeds, but simply encourages us to listen to the Dharma (teachings) and, if we find them to be true through our own life experiences, then to follow them. All beings seek happiness, but we don’t always know where to find it. Actually, Buddhism teaches us that we look for it in all the wrong places. True happiness is not something we can find outside of ourselves, but it is something that we can discover within ourselves.Buddhism is a way of life, unfolding to reveal the real meaning of our lives and our existence. It enables us to live a dynamic and fulfilling life, a life of deep gratitude, reverence and humility. The first and most profound teaching of the Buddha is the Four Noble Truths. There are several sects or schools of Buddhism that look to the Buddha (Enlightened One) as founder and teacher. Different Buddhist sects celebrate Buddha’s teachings through different practices, rituals and emphasis on differenct aspects of his teachings. While other schools of Buddhism seek to “attain” or “realize” enlightenment, the Shin Buddhist path is one of simply listening and opening one’s heart to receiving it. The pursuit of enlightenment can become something like chasing after a mirage in the desert: You think you have arrived, only to find it has disappeared. Simply listen : this is the Shin Buddhist path. Rather than pursuing enlightenment, we simply listen to the Dharma and receive it, and allow it to unfold into our hearts and minds. You don’t have to become a monk or sit for hours in meditation. You can listen to the Dharma in your everyday life, no matter what you do or where you are. Listening to the Dharma can mean listening to a sermon or lecture, but it can also mean listening or talking to anyone. You never know who might be your teacher of the Dharma, if you have the ears and heart to listen to life unfolding around you. Shakyamuni taught that we live lives characterized by difficulties. These difficulties result from our inability to see things as they are. Our preferences and prejudices influence how we see and engage the world resulting in difficulties for ourselves and others. The resolution of difficulties through cultivating a mind that sees things as they are is the Buddha Dharma. Shinran Shonin, who founded Shin Buddhism in the 1200s in Japan, lived life as a monk for 20 years, but could not find enlightenment. He saw himself as mired by his own ego-centric mind. But he met a teacher named Honen, who was teaching that the Dharma can be received whether one is a monk or lay person. The lifestyle did not matter as much as having the right attitude in listening and receiving the teaching. Honen taught Shinran that the Dharma is “received,” and that we must simply open our hearts and minds to it in gratitude. 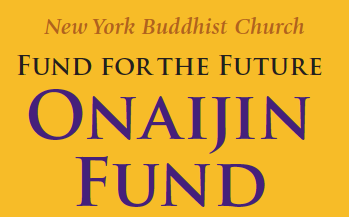 Shinran found hope in the Vow of Amida Buddha, which assures all beings salvation from Samsara ("the world of woes"). The assurance of Amida Buddha allowed him to see things as they truly are. With deepening awareness, Shinran could live with gratitude and appreciation of life, once the light of the Dharma permeated his heart and mind, illuminating and penetrating into even the darkest corners of his ego self. Strength in life: The life of humility is the most powerful and dynamic life. In the West, we think humility means being weak or passive, but humility is the true strength of life. We think that an oak tree is tall and firm, but in a strong wind, the oak tree breaks. A willow or bamboo, however, is soft and flexible, and can bend and not break in a strong wind. A humble person is truly strong, whereas a rigid, stubborn person is actually weak. Other’s sacrifices: When we begin to look at life from the perspective of the recipient, then everything in life is a gift—what we know, what we own, what we have achieved. They are all in a sense gifts, because nothing can be accomplished on one’s own. The successful businessman is successful because of his customers, because of his employees, because of his business knowledge that he has learned from others. The Olympic Gold Medalist, of course, trains and accomplishes an amazing athletic feat. But, in reality, it would not have been possible without coaches and teammates, family and supporters. The Shin Buddhist way of life is the life of unending gratitude. The more one becomes grateful, the more one becomes humble. The more one becomes humble, the less one needs in life. The less one needs in life, the more one truly has. Teaching: Attaining the “entrusting heart”—awakening to the compassion of Amida Tathagata (Buddha) through the working of the Primal Vow—we shall walk the path of life reciting Amida’s Name (Nembutsu). At the end of life, we will be born in the Pure Land and attain Buddhahood, returning at once to this delusional world to guide people to awakening. Way of life: Guided by the teaching of Shinran Shonin, we shall listen to the compassionate calling of Amida Tathagata and recite the Nembutsu. While always reflecting on ourselves, amid our feelings of regret and joy, we shall live expressing our gratitude without depending on petitionary prayer and superstition. Purpose: The Hongwanji is a community of people joined together in revering the teaching of Shinran Shonin and saying the Nembutsu. We seek to share with others the wisdom and compassion of Amida Tathagata. By doing so, we shall work toward the realization of a society in which everyone is able to live a life of spiritual fulfillment.